Clicking Whales - Who is Speaking? 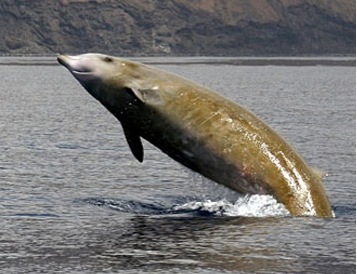 Toothed whales (odontocetes), including sperm and beaked whales, emit very loud clicks into the water. They do this in order to echolocate: they listen to the echoes from the surface and the bottom to know where they are in the water column, and they listen to echoes from their prey in order to locate their food. A fascinating research question is whether whales can tell which of their comrades is clicking from subtle differences in the clicks emitted by each whale. There are evolutionary advantages to being able to identify the speaker. As examples, 1) calves can recognize their mothers, and 2) the animals can synchronize their dives, which they do. A very interesting related question is whether humans, who are also listening with hydrophones underwater, can identify each whale from the properties of its clicks. Sperm whales, which have very large heads (up to 20 ft long) and emit extremely loud clicks, are interesting because they also emit clicks which are thought to be for communication purposes. A group of these clicks, called a coda, is 6 to 15 clicks in a row spanning about half a second. Beaked whales, which are often very shy and difficult to see since they rest below the surface instead of at the surface, are especially intriguing. Although their echolocation clicks are more difficult to use for individual identification, we are also making progress for these clicks. We study both the time properties of the individual clicks and also their properties after they are analyzed into component waves of different frequencies (the way the human ear and brain analyze sounds). 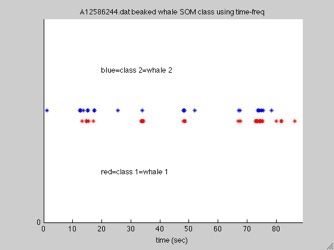 These techniques, collectively referred to as cluster analysis, associate similar codas or echolocation clicks with each other assuming similar clicks come from the same whale, and results so far are promising. What is needed is a way to know if our associations do indeed correspond correctly to individual whales. Therefore, we have begun to locate the whales acoustically at the same time we are identifying them, thus confirming that clicks do come from the same whale. We are also testing other cues. If our identifications of individual whales are verified, the research can have significant benefit both for behavioral studies of the whales and for population estimation. This work has been done by the Littoral Acoustic Demonstration Center (LADC), an organization comprising scientists from four universities (the University of New Orleans, the University of Southern Mississippi, the University of Louisiana at Lafayette, and the Applied Research Laboratories at the University of Texas at Austin) and the U. S. Navy. The underwater recordings are made on Environmental Acoustic Recording System (EARS) data buoys in the northern Gulf of Mexico. LADC made the first recordings of beaked whale clicks in the Gulf of Mexico. 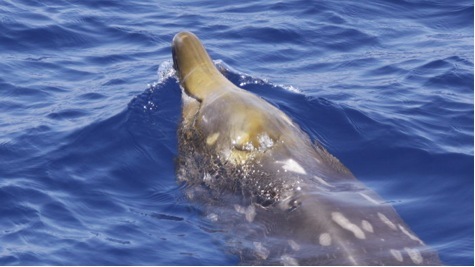 The data are analyzed to deduce identifications of individual beaked whales. The technique used for clustering the beaked whale clicks is called self-organizing maps. The clusters of clicks show similarities for all the clicks in a class (representing an individual), but significant differences from class to class, suggesting that this approach has promise for identifying individuals. Recent work by Baggenstoss, who has used cross correlations of clicks to assist in associating beaked whale clicks into trains, reinforces the idea that single click properties can be associated with individuals. Fig. #3: Clicks versus time sorted into classes.